In a third day of a blistering salvo against North Korea, US President Donald Trump said Thursday his “fire and fury” comment may have not been “tough enough” because Pyongyang should be “very, very nervous” about the consequences it could possibly face with any military action. 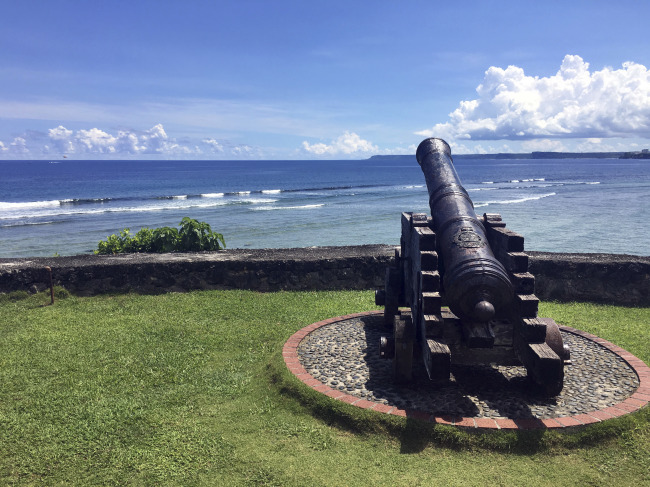 Earlier in the day, Pyongyang outlined its plan to fire missiles to “envelope” Guam in unsettlingly unusual detail, while blasting Trump as “bereft of reason” and with whom “only absolute force” instead of sound dialogue could work. Despite concerns that the escalating war of words might culminate in an armed clash driven by miscalculation, Trump refused to back down, upping his criticism against the Kim Jong-un regime. US President Donald Trump (center) speaks to reporters after a security briefing with National Security Adviser H.R. McMaster (left) and Vice President Mike Pence at Trump`s golf estate in Bedminster, New Jersey, Thursday. The hawkish Republican declined to say whether the US is considering a pre-emptive strike on the North’s missile sites as some news reports suggested, while leaving open the possibility of negotiations. “If North Korea does anything in terms of even thinking about an attack on anybody we love or we represent or our allies or us, they can be very, very nervous,” the president said. 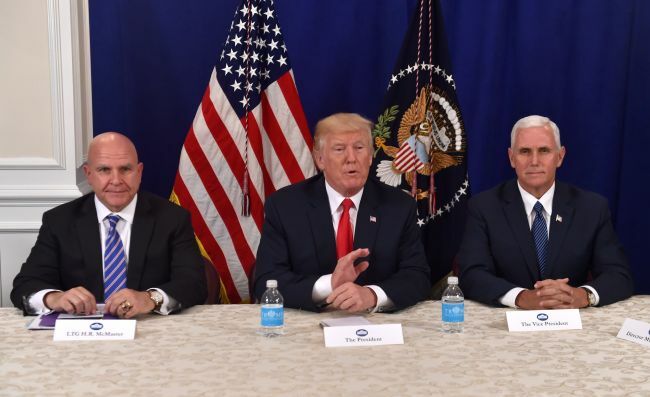 The remarks coincided with a national security briefing, where Trump was accompanied by Vice President Mike Pence, White House national security adviser H.R. McMaster and Central Intelligence Agency Director Mike Pompeo, among others. Following the session, Trump said he will boost the missile defense budget by “many billions of dollars” and added the nation’s nuclear arsenal is “in tip-top shape” thanks to modernization and renovation work. The mood has been souring since Pyongyang test-fired two intercontinental ballistic missiles last month. But the trade of belligerent rhetoric began gaining steam after the UN Security Council passed a new sweeping resolution last week, which prompted the Kim regime’s stringent backlash. On Thursday, Kim Rak-gyom, commander of the North Korean People’s Army’s Strategic Forces, said the military had devised a plan to launch four Hwasong-12 intermediate-range ballistic missiles toward Guam to “signal a crucial warning” to Washington. The plan will be finalized by mid-August and reported to the young leader for orders. The skyrocketing tension is giving rise to cautionary voices in Seoul, Washington and elsewhere. US Secretary of Defense Jim Mattis, who warned Pyongyang of “the end of its regime and the destruction of its people” Wednesday, softened his tone a day later, stressing the significance of diplomacy, though he did not rule out a military option. “You can see the American effort is diplomatically led. It has diplomatic traction. It is gaining diplomatic results. And I want to stay right there right now,” he told reporters at an event in California. Wary of a potential US military action or armed conflict with the North, Cheong Wa Dae arranged a phone call between National Security Office chief Chung Eui-yong and McMaster on Friday. During a 40-minute conversation, the officials examined the current situation on the peninsula and coordinated their step-by-step responses, presidential press secretary Park Soo-hyun said. “The sides reaffirmed their pledge to cooperate closely and in a transparent manner on the steps to be taken by phase to ensure the two countries’ security and peoples’ safety,” Park told reporters, without elaborating on the measures. “These statements are irresponsible and dangerous, and also senselessly provide a boon to domestic North Korean propaganda, which has long sought to portray the US as a threat to their people,” the letter reads, pointing to Trump’s “fire and fury” comments. In New York, UN Secretary-General Antonio Guterres reiterated how “troubled” he is by the situation and that he is “always willing” to play a mediator role. “(Guterres) welcomes all initiatives that will help de-escalate the tensions and a return to diplomacy,” his spokesman Stephane Dujarric said Thursday.